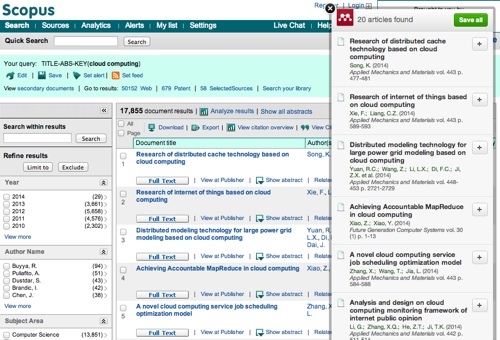 Mendeley users can now import directly from Scopus! We’re constantly looking to expand our web importer so that that it supports as many databases and formats as possible. In September we integrated full-text direct importing functionality from ScienceDirect, and now it’s great to be able to add Scopus – the largest abstract and citation database of peer-reviewed literature – to that list as well. Users can import individual or multiple Scopus documents (subject to entitlements of course) directly to their Mendeley Library. The importer also retrieves all the relevant metadata for the documents you’re viewing, making the whole process of searching and adding those abstracts and citations really smooth and intuitive. The aim is to keep on adding functionality and features that make your research workflow faster, easier and more efficient. Please give it a try and let us know what you think!